Whether it’s electric or gas, we can help. Our fully trained engineers can repair most brands of cookers including AEG, Beko, Flavel, Hotpoint and Indesit. We offer a fixed price oven repair which is for the call out, labour charges and parts. Repairs are done on a “no fix, no fee” basis. 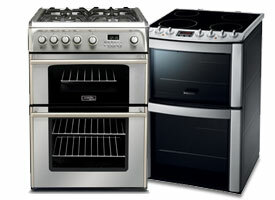 If we are repairing a gas cooker or gas range style cooker, we will send a Gas Safe repair expert. The fixed price includes the call out to your home, labour and parts. If we find that your cooker is beyond economical repair*, we will give you a full refund. Your repair also comes with a 12 month guarantee. You can arrange a visit from our engineers 6 days a week, for most of the Ireland. Our engineer will call 30 minutes before they arrive so you can be ready. You can also receive additional protection by purchasing our Expert Repair service. This covers other faults and general breakdown for 12 months. Is your cooker causing you problems?